According to the common theory on steroid receptor mechanism, the amount of cytosol estrogen receptor, as well as the intranuclear estradiol-receptor complex, is influenced by intracellular estradiol levels . Intracellular estradiol arises from two sources: from peripheral estradiol by transport into the tumor cell and by intratumoral biosynthesis from other steroids. It is well known that cytosol receptor values are invariably low in tumors from women with high (premenopausal) serum estrogens, probably owing to blockade of the receptor by endogenous estradiol. In such cases intratumoral estradiol formation will probably be less important. 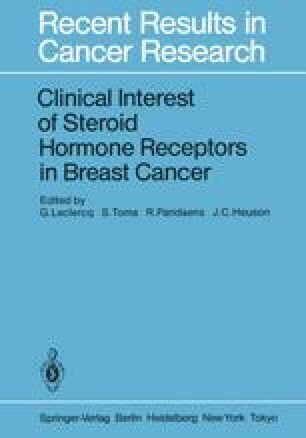 On the other hand, receptor-rich as well as receptor-poor tumors are found in women with low (postmenopausal) peripheral estrogens, and in such cases intratumoral estradiol biosynthesis may be of clinical importance. The following discussion will be restricted to the situation present in the postmenopausal woman and will cover three pathways of intratumoral estradiol formation: (a) reduction of estrone; (b) ring A aromatization of androgens; and (c) hydrolysis of estrogen conjugates.